Is Food Safety on Your Holiday List? Americans follow all kinds of “nutrition” plans but very few have a plan to prevent foodborne illness. Foodborne illness is caused by consuming food contaminated by certain disease-causing microorganisms (bacteria, viruses or parasites) known as pathogens. Although our food supply is one of the safest in the world, foodborne illness still affects many Americans each year. The Centers for Disease Control and Prevention report that annually 48 million persons become ill, 128,000 are hospitalized and 3,000 die from foodborne illness in the United States. Everyone is at risk for getting foodborne illness, however some people are more at risk than others. Typically, babies, young children, individuals with chronic diseases and compromised immune systems, pregnant women and older adults are more susceptible. Foodborne illness can cause a range of symptoms depending on the health status of the person and the pathogen causing the illness. Some illnesses cause symptoms such as diarrhea, fever, nausea, stomach cramps and vomiting. However, some potent pathogens can cause long-term health problems and in severe cases even death. Click here to visit the Centers for Disease Control and Prevention’s website for more information on foodborne illness. Food Safety is Important for Everyone. What’s Your Plan? Don’t take chances with your family’s health. Knowing about food safety is not enough. You need to act by developing a plan based on four basic steps. 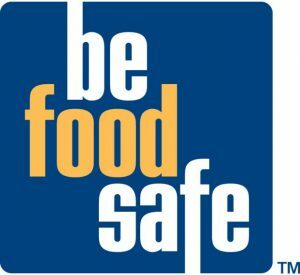 Understanding and practicing the four basic steps to food safety, whether at home or away, can go a long way in helping prevent foodborne illness. > Wash hands before, during and after food preparation. > Wash and sanitize utensils, cutting boards and surfaces during the food preparation process. > Prevent cross contamination by keeping ready-to-eat and raw and cooked food separate when purchasing, storing and preparing. 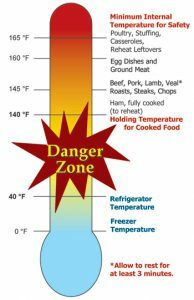 > Make sure food is cooked to the proper minimum internal temperature required to destroy pathogens that can cause foodborne illness. > Use of a food thermometer is the best method to determine if the food has reached the proper temperature. > Keep perishable food refrigerated at 40˚F or below. > Do not allow perishable food to stay in the danger zone (between 40˚F to 140˚F) for more than 2 hours. > Refrigerate perishable food promptly after cooking.